ABC Commercial heading to MIPJUNIOR 2012 with packed slate of fun new children’s programming. LITTLE TED’S BIG ADVENTURE (20 x 2.5’): From the team behind Australia’s favourite pre-school series, PLAY SCHOOL, these fun interstitials explore different forms of transport and are hosted by popular teddy bear character, Little Ted and his friends. From boats, to submarines, from planes to dog sleds, Little Ted meets the drivers of each vehicle and even goes for a ride! GIGGLE GALLERY INTERSTITIALS (20 x 1’): From the team behind the Kidscreen 2012 award-winning hosts, GIGGLE AND HOOT, come these fun-filled interstitials for pre-schoolers, exploring the world of art. Each episode features a different song and animation that explores an aspect of art for kids, from self-portraits to still life. Using a variety of storytelling devises and approaches, MY GREAT BIG ADVENTURE (10 x 20’ HD) is a lifestyle series that provides children with a toolkit for challenging situations. Set out and about in the real world, this is a show that tackles issues such as bullying, divorce and disability, in an empowering, engaging and fresh way. THE AMAZING HOUSE (26 x 26’ HD + webisodes) is where amazing things happen. 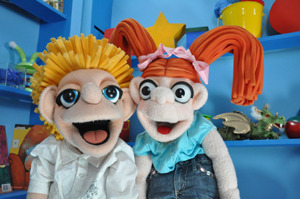 The program focuses on two puppet characters, Fi-Be and Benji who live in The Amazing House and who are visited by Alex. Amazing things happen to them all along the way, while teaching early reading skills for children between the ages of 3–6. FIGARO PHO (series one: 26 x 1.5’) will also be making another appearance at MIPJUNIOR, this time in a longform series, THE ADVENTURES OF FIGARO PHO (13 x 24’ HD or 39 x 7’ HD). Figaro Pho is a warm-hearted, adorable, quirky and mischievous character…who just happens to be afflicted with a multitude of weird and wonderful phobias.The series is the brainchild of renowned Australian director and children’s book illustrator, Luke Jurevicius, and creative consultant Deane Taylor, who is well known for his Art Direction on Tim Burton’s The Nightmare Before Christmas. ABC Commercial is distributing THE ADVENTURES OF FIGARO PHO in selected territories. The ever-popular BANANAS IN PYJAMAS are back with a second CGI animated series (Series One: 104 x 12’, Series 2: 52 x 12’). Boasting all new adventures, stories and music that encapsulate the fun and playfulness that is Bananas in Pyjamas, those lovable Bananas, B1 and B2, are again joined in the series by their best friends from Cuddlestown, the adorable teddies, Lulu, Morgan and Amy and the mischievous Rat. ABC Commercial is distributing BANANAS IN PYJAMAS in selected territories.